Do Fantasy Sports Lead to Real-Life Consequences for You? Posted on November 5, 2015 by Amy W.
About 41 million people in the U.S. and Canada played fantasy sports in 2014, spending an average of nearly 9 hours each week on the activity, according to the Fantasy Sports Trade Association. Most people who participate in fantasy sports are able to play for fun—and it will never negatively impact their lives. However, for some, particularly those already at risk for problem gambling, it may provide one more avenue to unhealthy gambling behavior. To find out if you or a loved one is at risk for developing gambling addiction, take the quiz on our home page. Contact Compass Mark through our online help form or call (717) 299-2831 for free, confidential problem gambling treatment referral in Lancaster, PA and Lebanon, PA. 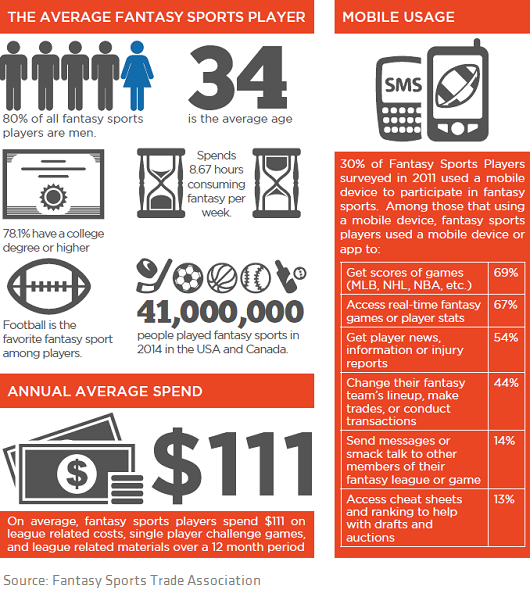 Check out the industry infographic below for more statistics on the popularity of fantasy sports.